Now having both in a bait is good however I am not sure it is practical. To put it into human terms we will all grab a bar of chocolate over a healthy balanced meal however we will eat more by volume of the healthy balanced meal than we will of chocolate ( well some of us anyway). To get back to bait, I see most of the most successful baits of all time are in category 1 whereas the instant attract baits ( the luminous ones with strong generally sweet flavours) are in category 2. Both categories have a use in carp fishing dependent on the situation however in this review we will be looking at baits that sit firmly in category 1. 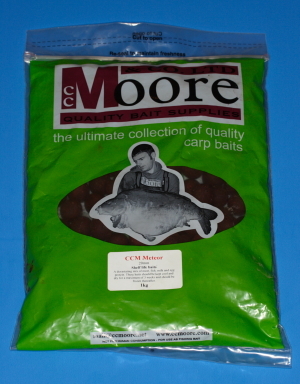 I 1st started to use CCmoore Meteor in the spring of 2009 after seeing it in Carpworld and then seeing it in “in the flesh” as it were at the carp show in Zwolle. I was instantly attracted to it as it has a warm meaty smell with no real odour of fishmeal. Whilst I really rate fishmeal I was concerned that the local anglers were using them heavily and as such I wanted a non fruit flavoured bait that was not fishmeal. 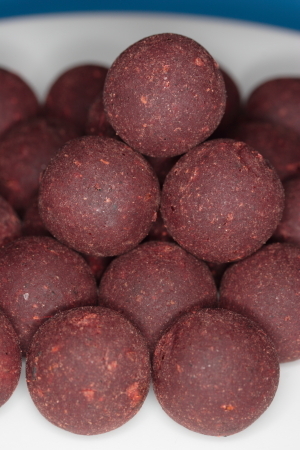 The bait its self is a lovely dark red and upon breaking one up you can clearly see that there is a healthy dose of bird seed present as well as a huge amount of robin red. The smell and taste is best described as milky meaty liver with a hint of something else. Not too strong but ” warm” reminding you of Sunday dinners coming in from the cold. As you can see the boillies just have that “eat me” look about them and are almost classic in their appearance. I do like red baits as in the shallow water they will stand out and under deeper conditions they will fade to a dull brown colour as the red light starts to be filtered out. That being said there is plenty of red light down to about 10m and I am not sure if I have caught a carp deeper then 5m. A bait is not a good bait unless it is backed up by a range of supporting components and meteor is well catered for in this respect. In addition to the boillies and popup’s there is also a bait dip, paste, stickmix and pellets. I particularly like the bait dip and it has a multitude of uses from a hook bait soak / hardener to a stickmix booster. I generally leave a handful of popups and bottom baits soaking for a month or so to really get them going. Once they have been in the dip for a while they take on a really lovely deep red colour and a slightly more salty taste that the carp seem to love. I have experimented with single glugged hookbaits to great success on a roving rod and I am certain that the glug sends out a cloud of signals that indicates a feast is to be had. A word of warning with the dip, it is red, very red. If you touch it your hands will be red, everything you touch will turn red, everything you touch that touches something else will turn red. It is amazing stuff and after a week in France where I went through 750ml of it my hands were a lovely pink colour for 2 weeks afterwards. Anyway no bait review is complete without some carp pictures and some comparison with other baits. Last summer myself and a group of Dutch anglers went to a lake in northern France. I chose to take 15kg’s of meteor and 5kg’s of the bait the other anglers were using as a backup. The other bait was a peach melba flavoured bird seed bait which to my smell and taste was very palatable. The results were astounding. Meteor was picking up 3-4 fish per 24 hour period per rod and the other bait managed 3 fish…. the same fish each time. I kid you not I managed to catch the same 15lb mirror with a deformed mouth 3 times in 3 days. Once I swapped that rod over to Meteor ( and fished it on a different spot) the fish started to arrive again. The instant pulling power of this bait can not be underestimated. The above low 30 was part of a 25 carp haul, 22 of which were on Meteor and consisted of 5 30’s and the rest 20’s ( apart from the mid double that loved the other boillies). Overall verdict – Buy it you know it makes sense. I bet you eat these when you’re fishing and your peperami runs out? you could indeed, not eaten these but almost managed to get one of the ladies at work to eat one of the strawberry and icecream popup’s. I tried one myself and they are lovely..